Is Hockey Hard? - Pro Ambitions Hockey, Inc. Founder of Pro Ambitions Hockey, Inc. This statement rang true for me a few times in my hockey career. I think that is why I find my truest pleasure in developing youth players in what I believe to be the right way for the right reasons. There are great coaches, there are good coaches and there are not so great or even not so good coaches who have their own agenda ahead of the team. I will never forget being told by a prominent NHL coach (I don’t want to mention names, he did go on to coach in the NHL which was clearly his agenda and is still in hockey but not as a head coach)as I was getting stitched up for blocking a shot with my face, in pain beyond words due to at the time unbeknownst to me a torn labrum… This was in between periods of a semi final playoff game in the minors, game 7 after I got beaten to the puck ”You cost us the game Serowik, you cost us the season, I will see to it that you will never play in the NHL.” This was a season where I was the first D on the depth chart, and a coach who only played four D all season, I played over 100 games and played my heart out. I had one of the best hockey seasons of my life. I was devastated beyond words hearing this from my coach. I will never forget it. But I did not let him or his threat define my destiny. After licking my wounds both physically and mentally for a few weeks, I got back to work to train for my next season that summer. All I could control that summer was my training and that is exactly what I did. Hockey is a sport that takes a lot of time to develop and train your skills especially because we are playing a game on a blade less than an inch in thickness and traveling at speed that can be in excess of 20mph for NHLers that is. In my opinion, to perform at your absolute best, you must trust what you learned in practice. You must overcome mental barriers that inhibit your game in order to perform those skills in a game. We all have these mental barriers. Skill development in a safe environment where you are not only allowed but encouraged to make mistakes is optimal. I just finished reading The Sports Gene by David Epstein, he talks about babies learning language by first babbling without a fear of failure in saying the wrong thing. That is my philosophy at Pro Ambitions. I study the game and have broken down exactly the best ways to develop skills. I realize that bad or old habits are hard to break especially in sports. Learn, Practice, Repetition, Trust What You Learned. Mental Training. I have had some of the greatest coaches in my lifetime of hockey, some that I put on my top ten list are from my youth hockey days. I think we can all relate to the parent coach who over plays their kid or the coach who never played the sport but is learning and trying their best. 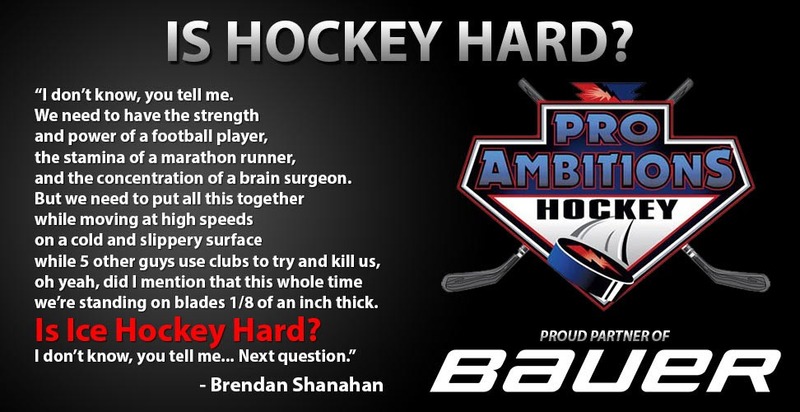 I always talk about the summer hockey growth spurt at Pro Ambitions. It is a proven stat in youth sports, that summer training is integral in skill development most especially in youth sports, especially hockey. We are coming to a city near you or come to us in Beantown at our AAA Boston University Camps. Our flagship location. We are the experts and will be training your player with unbiased sets of eyes. We are here to help them attain their pro ambitions, whatever they may be. We have countless campers in the NHL today. Your player’s bar may be that, college recruitment or making their high school team. Every player’s bar is important to us. We are getting a lot of sign ups for 1 v 1 personal coaching at your camp. This option is offered at check out for your camp. Note we only allocated five personal coaching options at each AAA Boston University Camp and less than that at our day camps. Sale continues 15% off until Halloween, only sale of the year, BU is flying off the shelf. Great savings, only have to put a deposit!